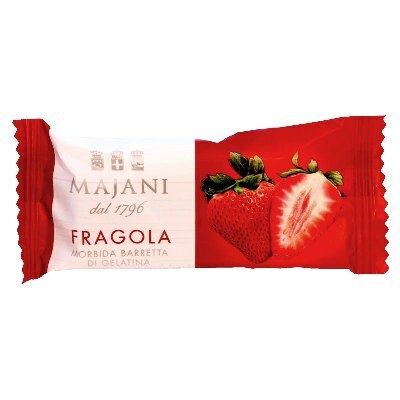 Experience the sweet fragrant flavor of spring and summer with these delicious strawberry fruit gel bars from Majani. Another yummy treat from the famous Italian chocolate makers from the Emilia-Romagna region, you can only be certain of their excellent standards. Made with 35% real fruit juice, these jelly candies are from fresh top quality raw ingredients. A box of these strawberry fruit gel bars are surely some worthy treats. Great for bringing some bit of sunshine to an otherwise dull and busy day. Other products by Majani are almonds, gianduia, hazelnuts, nougats, and fruit candies. They are most famous for their signature FIAT cubes that was first created in 1911 to help launch the Fiat car.